This is a hidden compartment meant to smuggle in illegal aliens from Mexico, taken in 1968. In 1965, the Immigration and Nationality Act, also known as the Hart-Celler Act, was signed into law by President Lyndon B. Johnson (Ball et al 2017). This act ended the quota system started in the 1920s that had been put in place that gave preference to those of European origin, and instead created a system that was meant to reunite immigrant families and attract skilled workers (History.com 2010). This original quota system, however, did not include Mexico (The John W. Kluge Center at the Library of Congress 2015). Because of this, temporary workers from Mexico were often hired to work on farms as part of the Bracero Program (Ball et al 2017). However, even after the end of this program as well as the introduction of the 1965 Immigration and Nationality Act, former workers that were part of the Bracero Program would still cross over the border to work these farm jobs. The Farm Labor Agreement, signed in 1942, was an agreement between the United States and Mexican governments that became known as the Bracero Program (National Parks Services, n.d.). Because of labor shortages due to World War II, farms were in need of people to tend to crops (The John W. Kluge Center at the Library of Congress 2015). The agreement between the governments allowed workers from Mexico to come to the United States to work as these much-needed farmhands (National Parks Services, n.d.). Despite World War II ending in 1945, the Bracero Program would continue until 1964. Because these braceros were not American citizens and did not have rights and were willing to take these jobs, farms were able to pay bracero workers lower wages (Omreka RSS, n.d.). When the Immigration and Nationality Act was put into effect, it was said by many that this would not have a major impact on the U.S. population (History.com 2010). However, because of such developments such as the Bracero Program as well as the new limitations on immigrants from the Western Hemisphere of the world, this led to a major increase in illegal immigration into the United States (Ball et al 2017). Despite the Bracero Program ending and the new Immigration Act making it so only certain people could enter the country, many former bracero workers would continue to cross the border to reach these same jobs illegally (Ball et al 2017). People would enlist such tactics as the one in the picture above to sneak these migrant workers across the border. The Vincentian way of life encourages people to respect others and to “foster a world view and to further efforts toward global harmony and development by creating an atmosphere in which all may imbibe and embody the spirit of compassionate concern for others” (St. John’s University, n.d.). With immigration being such a hot topic in today’s social and political climate, it’s important to understand why illegal immigration even became a thing as well understanding where and why many of these immigrants came to the United States. Fully understanding the background of these immigrants shows the Vincentian way of respect and compassion for others. 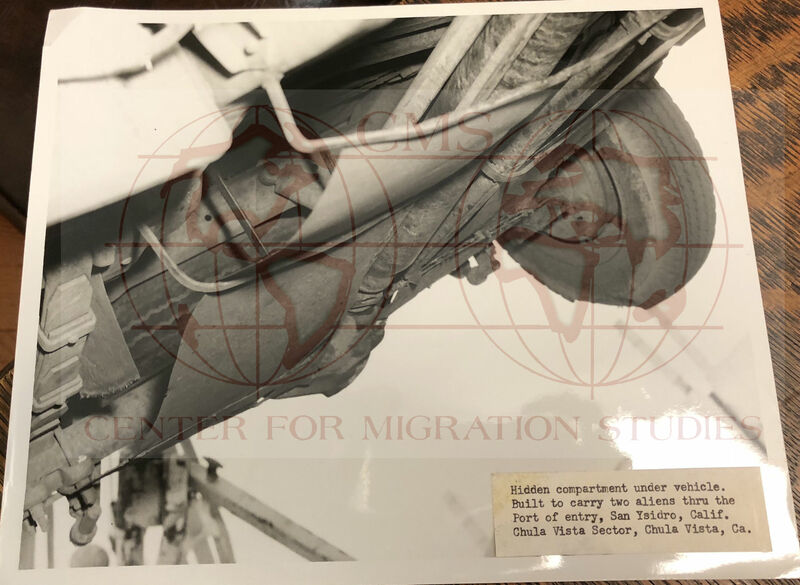 This entry was posted in Uncategorized and tagged 1968, Academic Service-Learning, Center for Migration Studies, Cline Collection, Immigration, Immigration reform, photograph. Bookmark the permalink.